I may be one of the few people who, while linking the word “Enron” to a company bankruptcy involving some crime or the other, had no clear understanding of what actually happened, as I just did not have any media access at the time and could not be bothered to follow up later. That’s an interesting starting point for watching the film, as the filmmakers’ approach seems to start with the assumption that everybody agrees on the sheer incredibility of what has happened and the stunning numbers involved. 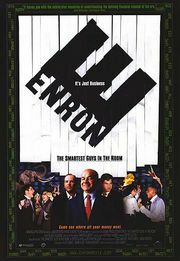 Watching it from my perspective shifted that perspective quite a bit: All through the film, the only thing I really found remarkable about the “Enron case” was the amount of money involved, which apparently was a lot. Apart from that, I saw a film about a company that tried to swallow too many meals at a time, threw up big time and disappeared. Whenever such a thing happens, it’s sad for employees and shareholders, and if management misbehaviour is involved, it sometimes makes a nice courtroom drama. Apart from that, the “why are you telling me all that?” feeling lingered.